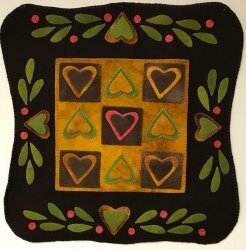 Welcome to Creekside Quilting's Weekly Newsletter! I would like to take a moment and congratulate all the 2018 All Iowa Shop Hop Winners from Creekside! The sponsor's this year were very generous, and everyone that has come into the store to pick-up their prize, has remarked "the prizes were very nice"! Our store winners include: Gwen Tabor, Lisa Bielser, Marsha Duea, Diane Kuhl, Jeneen Pearson, Jana Schwerdtfeger, Sheryl Houston, Jean Hogue, Kathy Ryan, Carol Huisman, Dena Baldus, Carol Allen, Cathy LeClaire, and Carol Winget. Congratulations to each of you for being a 2018 All Iowa Shop Hop winner! We are looking for a certified sewing machine technician....if you know your way around a sewing machine and are certified in cleaning and repairs, please let me know! We have a great customer base that is anxiously awaiting your arrival! Please contact me at the store or via email to discuss this flexible position. 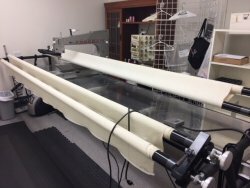 Since we are starting the newsletter off with sewing machines, we might as well continue with updates on our Pfaff machines. have been on display in our store since June, yet never sewn on....I am closing both machines out with 25% off MSRP. You won't find these machines priced lower anywhere! They are absolutely wonderful machines, it is just not a representation of our customer base. So, let's close these two machines out and bring in the new machines our customers are wanting! Pfaff is also closing out the following machines at these prices. We have only a few left in stock and the prices are right! It's retreat time! 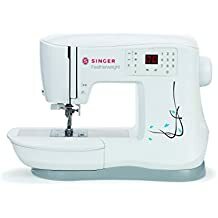 Would you like a good little lightweight sewing machine to take to upcoming fall retreats? The Singer Featherweight is a good machine to have and stitches up beautifully! We are selling it a little below MSRP and have 3 in stock. 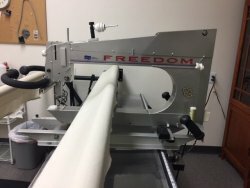 Our Long Arm machine is still for sale and I dropped the price down to $7500. Please let me know if you are interested! Yep, that's right! Creekside is hosting a retreat! I am just thrilled at how many calls we have received over the past week with interest in "more details" about our retreat! Thank you! This is so encouraging! Retreat dates: November 30th 5-9pm through December 1st 8am-4pm. The cost of the retreat will be $25 per person and will cover Friday night dinner, Saturday morning continental breakfast, and then a light lunch. We will also have two door prizes and a couple of fun give aways! If you are coming in from out of town, I will see if I can get a discount on a close hotel room for Friday night, just call or email me with the request. Can't make a promise, but if this is successful, maybe I can work out some type of a special room rate. Thursday, October 18th from 6-8 pm. This is a great class to learn how to get the corners sharp and correct! In judging, the binding makes or breaks a quilt and practice and learning new ideas and techniques is always a plus! There will be NO APPLIQUE SEW-IN Wednesday September 19th. We still have plenty of room for people to join us in the UFO Friday Afternoon Club that meets Friday, September 28th from 1-4 pm. If you have any UFO's, this club is for you! $10 for the whole year, snacks, wine and cheese every month, and prizes at the end of the year! Great motivational way to get the UFO's that are sitting on your sewing table, completed! Ever wanted to learn how to use the Tucker Trimmer Ruler by a certified instructor? Ever heard of Tucker University and curious about what that is all about? 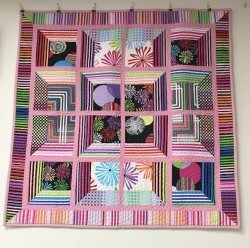 Well, we are honored to have Rosella Hanson teaching The Starr Pizzazz Table Runner on Saturday, October 13 starting at 10 am! Rosella is a certified trainer with the Tucker Trimmer and this class focuses on how to use the Tucker Trimmer Ruler. 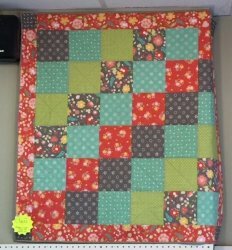 The quilt table runner is beautiful, and by the end of the class, you should have a new table runner top, just in time for Thanksgiving! Pattern, ruler, and kit can be purchased at the store. Scissor and Knife Sharpening will be available at the store on Friday, October 26th from 10:30 am-3:30 pm. Just in time for the holidays! Plan to bring your scissors and knives to the store on October 26th. 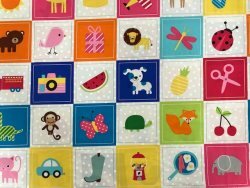 A Kids class on Beginning Quilting November 2nd and 9th from 4:30-6pm both days. Come join Janice for our 1st ever Beginning Kids Class! We will learn to make a set of quilted placemats just in time for the holiday table setting. The cost for this fun class will be $35.00, which covers both sessions and $9.50 for the kit. All class fees go straight to paying the incoming instructor! Are you sick of me yet? Seems as though this newsletter get's longer and longer each week! 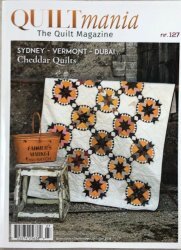 I keep telling myself, "this is good, because we have a lot to share with our family of quilters!" 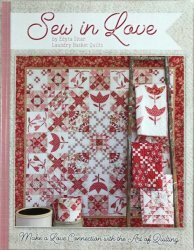 This book, Sew in Love, was recommended by one of our customers, and I can already see it will be a favorite to many of our customers! These two I'Spy panels are bright and fun for kids to play on! 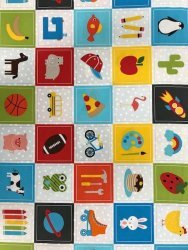 Barb suggested buying two panels, cutting the squares out and making the squares into a game of Concentration for the little ones! Sure is a cute idea on how to use this fabric! 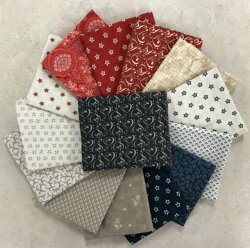 The new Minick and Simpson Portsmouth line of fabric is already demonstrating to be a hit for our patriotic quilters! 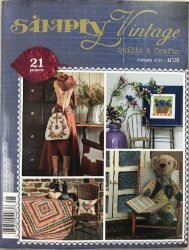 Fall subscriptions of Quiltmania and Simply Vintage arrived in the store late last week. If you have one of these magazines on hold, please come in and retrieve it within the next 30 days. Thanks! As always, these magazines never disappoint! In our wool area, Patty made this cute wall hanging called Everlasting Hearts. Pattern is in the store, kits are coming! Lastly is this cute Happy Halloween panel! It's a part of the Patrick Lose panel we showed you last week, called Trick or Treat! Julia made both of them....just had to toot her horn a tad bit! As promised last week, I will show you another Karen Burrier's quilts she is showcasing in our classroom this month! She has been so sweet to take calls from people just asking her questions or wondering where she got a pattern. 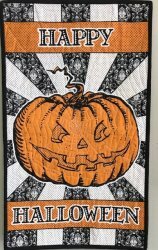 October's theme is fall or Halloween...please bring in your quilts by the 28th of the month to showcase! Whew! I'm tired! If you made it all the way to the end of this newsletter with me...I'm giving you an A+ AND a Gold Star! That was a lot of information for one week! Many of you are starting your Christmas sewing, so let's kick the holiday sewing season off with 20% off all Christmas and Halloween fabrics! No preference on size cut, but fat quarters are excluded from this weeks special. This special is only good from 9/18/2018 through 9/24/2018 and must be mentioned at time of cutting fabric. Looking forward to seeing everyone in the store! Show and Tells are the best...so bring your show and tell in and toot your horn!